I had the fish tacos today and they were outstanding! The customer service was very good and a very fair price for lunch. The WMD (beef chili, beans and cheese) was excellent, flavors blended nicely together, outside was crispy and not too burnt (a complaint I sometimes have with this truck). The Amazingly Aroi pork sounded great, but the package was mismarked and I got two WMD instead. Not so bad since I liked it, but if I was a vegetarian and I got the wrong one, or I had food allergies, that could be very bad. PLEASE make sure these are labeled correctly! Flavor was really good. I really liked the beef (El Toro) better than the chorizo as the beef was a bit more flavorful. Really, my only complaint - 3 small empanadas for $10. Usually, when you spend $10, you get a nice size meal. 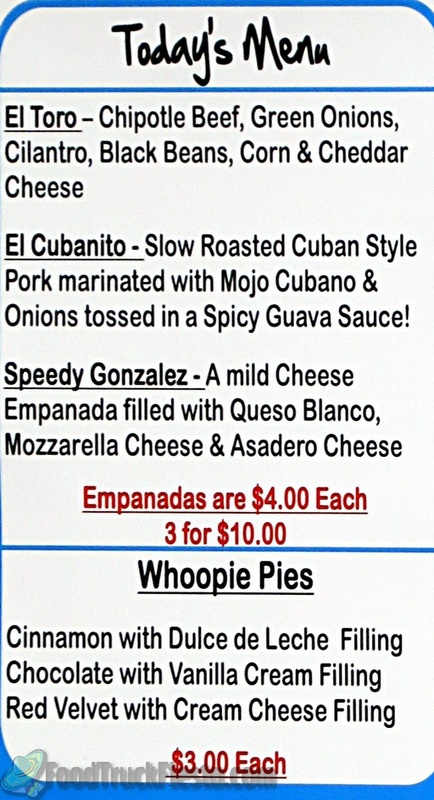 But, I understand, DC Empanadas needs to make money. Top Notch and hugely flavorful. I had both the El Toro and the El Matador. Both were perfectly crispy on the outside and deliciously cooked and seasoned on the inside. Balance of flavor on both was perfect with just the right kick of spice. If you are hungry order three, they aren't huge. I would have given them five stars if they had a salad or some other side option to create a perfect lite meal. 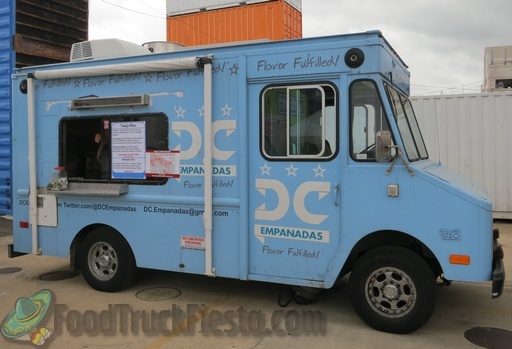 Generally I look forward to this empanada truck-it's one of the original food trucks making the rounds in downtown D.C. Their traditional beef empanada is my hands down favorite, but the other varieties are flavorful as well (particularly the shredded pork varieties). Today I ordered a whoopie pie for the first time and I will not make that mistake again. It was the size of a 50 cent piece and I was charged a whopping $3 for it. I have no problem with small desserts as long as it's priced accordingly. There is another truck offering whoopie pies, the traditional size (big enough to share) for the same price so I don't feel I got my money's worth today. I'll be sticking to the empanadas from now on. I was slightly disappointed by the Something Stuffed truck, whose burned, too crispy empanadas that scraped my upper palate. The charred outside did nothing for the undercooked innards. Their flavor was bland, so I prepared to be disappointed with DC Empanadas. I WAS PLEASANTLY SURPRISED BY DC EMPANADAS - Perfectly cooked empanadas, flaky, yet soft enough on the palate to crunch in without getting cut up in your mouth! The innards were masterfully prepared and the flavors complemented each other without too much complexity. I didn't stare into it wondering "what's in this", the ingredients were fresh and obvious to the human eye!! They also keep it "real", offering flavor combinations that don't require an adventurous spirit to try - I am a "foodie", but sometimes I like food that I don't have to THINK about to enjoy. HIGHLY recommend this truck and hope they stick around for the long haul. Slow roasted cuban style pork tossed with onions and spicy guava sauce. Really tasty with a lot of meat. I only wish there was a little bit more guava sauce - I should have asked for some on the side. I also got a cookie/whoopie pie (Frenchies) that was delicious. Over-rated and bland. The "empanada of the day" was the columbian beef. It was smaller than a normal size empanada, which was fine. But when I bit into it...bland and tasteless. Disappointing. DC Empanadas is bringing a unique twist on empanadas to the nation’s capital. They started serving on January 5, 2011.